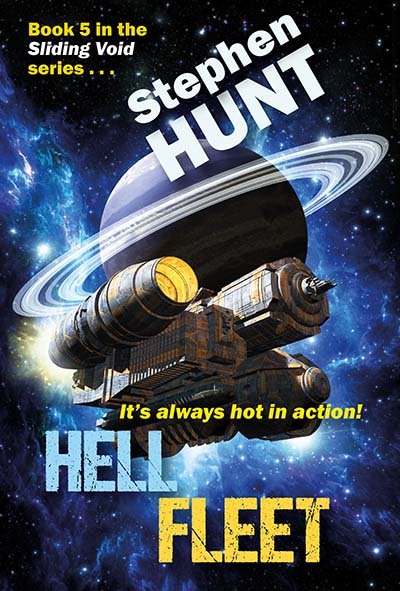 ‘Hell Fleet‘ is the 5th book in Sliding Void series. It’s a completely stand-alone adventure, not directly linked to the first four books, and will be released early December 2018 in both print and e-book format. (1) Her beloved crewman Calder Durk’s gone missing. (2) She now has a daughter to bring up on the rickety free-trader ship, Gravity Rose. (3) Said daughter’s from a parallel dimension (and that’s only the start of her strangeness). (1) She’s stuck at the dog-end of the galaxy on punishment duty with the Fleet’s losers, thieves and pedantic pen-pushers. (2) Large portions of her sector just went dark. (3) Something big, bad, and particularly nasty is now heading her way. Both their troubles are about to collide and multiply in the most horrific manner since the Vela Supernova Remnant detonated. Sometimes, the future’s so bright you better bring lead-lined shades. And a rail-cannon or three. Because Earth’s best space opera series just met the page-turning universe of military science fiction! Paper! Must have real paper book. Will this come out in real book form? Paper copy should be live in a a couple of weeks, too. « Got a hyperlink on your web-site? Hey, there’s a EU tax for that!